In ovenproof 12-inch skillet, heat 1 tablespoon butter over medium-high heat. Add chorizo; cook 7 to 8 minutes, stirring frequently, until no longer pink. Sprinkle with flour; cook and stir 1 to 2 minutes. Stir in 3 cups milk, the tomatoes and green chiles. Heat to simmering; simmer 2 to 3 minutes or until slightly thickened. Add Kraft™ Velveeta™ cheese; stir until melted. Remove from heat; stir in shredded Cheddar cheese. In medium bowl, mix Bisquick™ mix and jalapeño chiles. Add 2/3 cup milk and 2 tablespoons melted butter; stir until just combined. 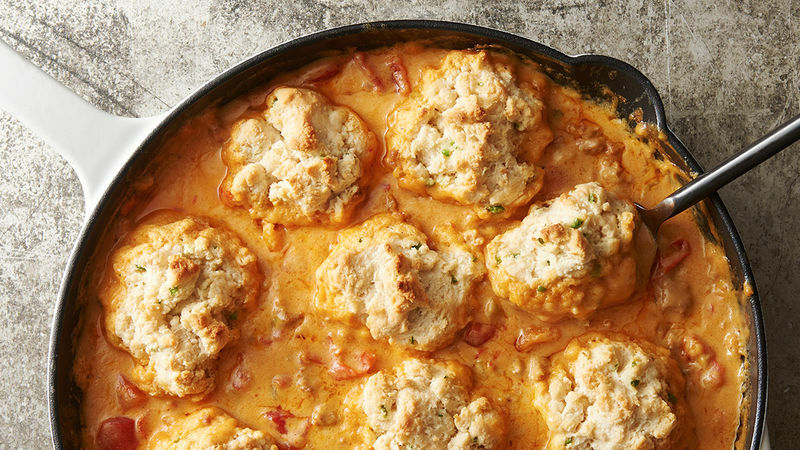 Drop biscuit dough into 10 biscuits on top of gravy in skillet. Bake 18 to 22 minutes or until biscuits are golden brown and cooked through. Jalapeño chiles can vary greatly in heat levels. With that in mind, it’s always good to taste a small bite before adding it into a recipe. When purchasing chorizo for this recipe, make sure to get the uncooked Mexican variety, as opposed to the cured Spanish variety.